“Amazing Animals” is the largest privately-owned collection of exotic animals in the UK, and one of the country’s only licensed providers of exotic wildlife for commercials, TV, movies, and advertisements. Their facility has the nice-sounding name of “Heythrop Zoological Gardens” but, except for six “open days” per year, it is not open to the public and does not have to comply with zoo laws and regulations. Amazing Animals is owned and directed by Jim Clubb. Clubb is a longtime circus lion trainer, chairman of the Association of Circus Proprietors of Great Britain (ACP) and is married to Sally Chipperfield, of the infamous Chipperfield circus dynasty. Clubb got his start training animals while working for the Chipperfields and was once part-owner and managing director of Clubb-Chipperfield, his own company that shared premises with Chipperfield’s circus in 1998. 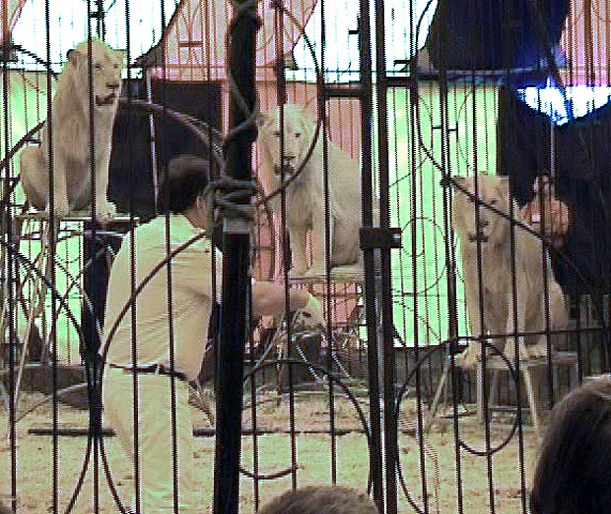 Clubb’s close ties with the Chipperfields are very concerning because while he was working with them, the directors of Chipperfield Enterprises were convicted of animal cruelty in 1999 after undercover investigations by Animal Defenders International revealed that they routinely used severe physical abuse to “train” their circus animals. ADI obtained footage of the Chipperfields beating lions and tigers with metal crowbars and pipes, whipping a sick elephant, beating camels with broom handles, and mercilessly thrashing a baby chimpanzee named Trudy with a riding crop while taunting the crying animal. The Chipperfield’s “litany of crimes against animals” were so shocking that the circus was shut down and the horrific footage convinced the UK government to ban the use of wild animals in circus acts nationwide (a ban which started in 2015). 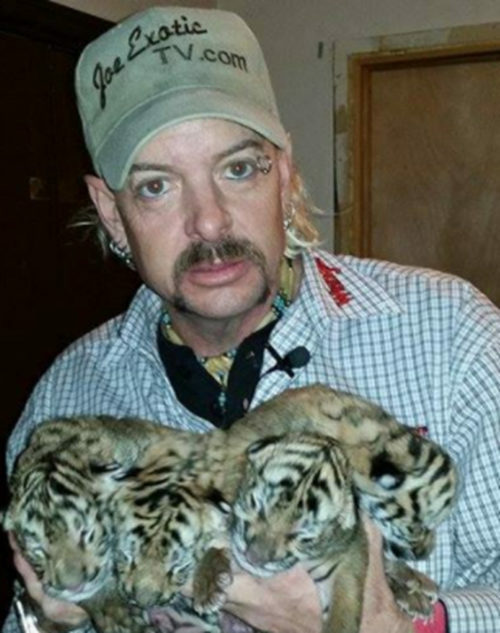 Despite the ban and the folding of the circus, Clubb continues to use his Amazing Animals business to train and sell big cats to circuses in other countries, and he makes his cats give circus-like “performances” to guests during the six days per year his facility is open to the public — if it were open any longer than that, it would have to be regulated like a zoo. This 2010 blog post by Clubb includes photos of him wielding long sticks to train a batch of white lions in a dark, dungeon-like room. In 2012, there was national outrage after an investigation by the Captive Animals’ Protection Society and LionAid revealed that these lions were born at the West Midlands Safari Park, which claimed to be a reputable zoo breeding the white lions for “conservation”. An article about this has been reproduced below. It fails to mention that the West Midlands Safari Park was founded by Jimmy Chipperfield (a relative of Clubb’s wife), that the current director of the Park is a former circus performer, and that Clubb’s lion act had previously performed at the Kinoshita circus where the cubs were sent. LionAid has more details about the circus connections in this case. Four rare white lion cubs born in a UK safari park have been sent to perform in a Japanese circus after being trained in a British facility. The cubs were born at West Midlands Safari Park, in Bewdley, Worcester, in 2008 but will spend their adult lives entertaining crowds in the Far East. Animal rights charities have expressed outrage after discovering they were flown 6,000 miles to Japan’s Circus Kinoshita. 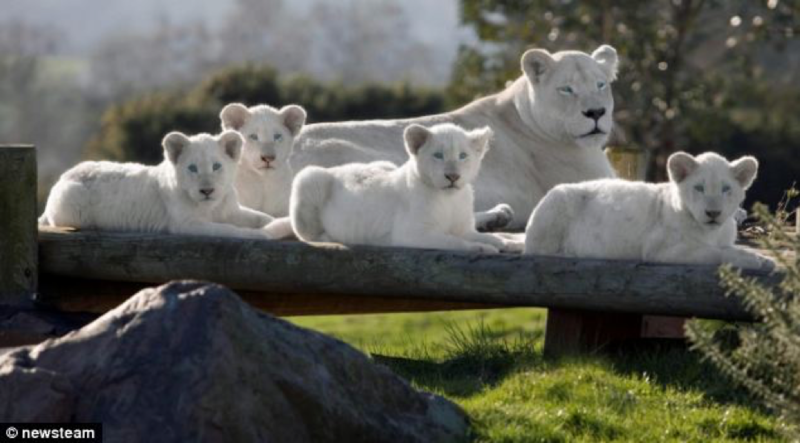 The safari park has been criticised for providing four rare white lion cubs to a businessman who provided them to a Japanese circus. It is understood one of the lions has since moved to a zoo in western Japan after it developed a nervous condition which caused its mane to fall out. The animals were given to British businessman Jim Clubb who runs Amazing Animals, which also goes by the name Heythrop Zoological Gardens, in Chipping Norton, Oxon. Undercover video footage taken by Captive Animals’ Protection Society (CAPS) and Lion Aid taken in 2010 appears to show Clubb training the lion cubs during an open day at his firm. 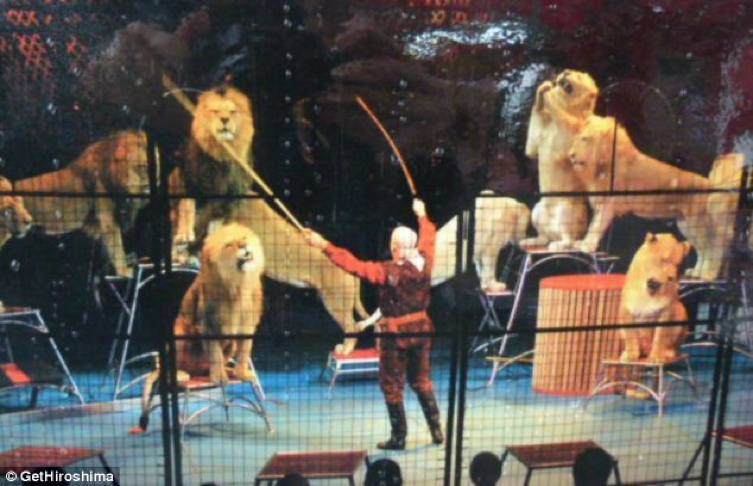 Months later the same lions were seen performing for a Japanese circus. 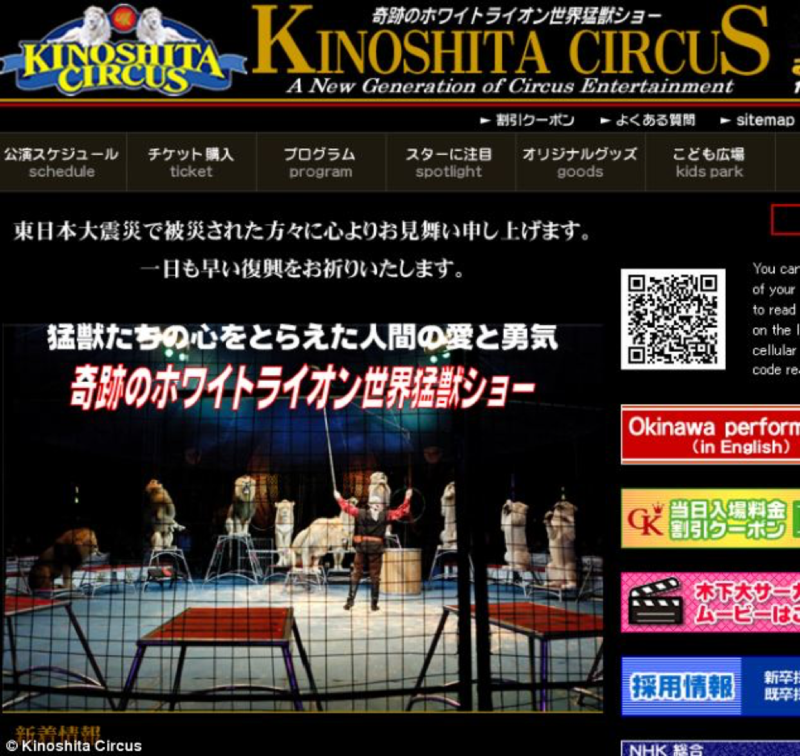 The Kinoshita Circus website boasts that four white lions currently being used in shows were all born in a UK zoo and trained at a UK site. It states: ‘When they became six months old, they were moved to an animal training facility in UK. 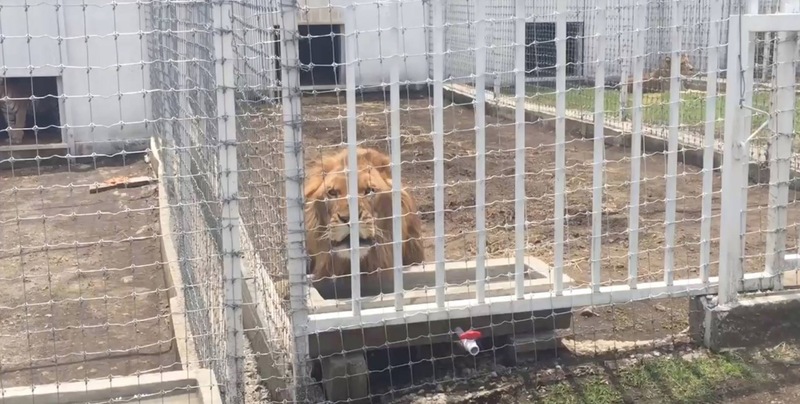 A Japanese investigator working for CAPS discovered one of the lions has been moved to a zoo in the west of the country after it was attacked by the other circus animals. The lion is reported to have developed a ‘nervous disease called autonomic ataxia’ causing his mane to completely fall out. Animal rights campaigners have criticized the safari park for allowing the lions to end up in a circus. CAPS director Liz Tyson said: ‘The current Government has promised an outright ban on the use of wild animals in circuses as a result of overwhelming public, expert and parliamentary support. ‘And yet here we have a zoo apparently providing lion cubs to this cruel and unethical trade via a middleman, whilst publicising their work to their paying visitors as based in conservation and welfare. ‘It is an appalling betrayal of those people that trust the zoo to protect and care for the animals. An investigation by CAPS claim the safari park has close ties with Clubb’s animal entertainment business. In 2007 Clubb appeared on the zoo’s own TV channel talking about his company which provides animals to the entertainment industry. This circus fan blog has posted 3 videos of Jim Clubb “working” his big cats in the studio with bamboo canes, which he uses to poke and prod the cats and to replicate the sound of a whip. The second video shows an agitated 10-year-old lion, King, growling and swiping at Clubb during an ad shoot in the noisy studio. Clubb’s voiceover reassures the viewers that King “really looks forward to this” and that training “stimulates” the animals and is “an extension of their play.” Odd, since the cat ran out of the studio as fast as he could once the door was opened. Maybe he wasn’t having fun, after all. In the last video, poor King is forced to perform again because the cameraman “missed” the first shot, even though the crew knows that King is already agitated and probably doesn’t want any more filming. Just like human actors, movie and TV animals are forced to do the same shot again and again until the director is pleased — only the animals don’t understand or have a choice in the matter. King comes out snarling and angry, the crew gets their shot, and Clubb happily proclaims that “the only thing that matters is that the director’s happy.” Not the animal. The director. The Captive Animals’ Protection Society (CAPS) has done several recent investigations of Amazing Animals and has produced lots of photos, videos, and notes about the facility for you to look through. One of the photos taken by CAPS shows a distressed white tiger pawing at one of the cracked glass windows of her enclosure. The cracks were “fixed” by painting jungle vines on top of them, posing a potential safety risk to the visitors crowded around the window.